Injured medic takes charge of the situation after terrorist stabs two in Mishor Adumim supermarket - giving instructions despite wounds. Arutz Sheva has obtained an audio recording of the Magen David Adom (MDA) paramedic who was wounded in Wednesday's stabbing in a Mishor Adumim Rami Levy store calling the MDA number, 101 - Israel's equivalent of 9-1-1. During the conversation, the paramedic can be heard briefing civilians nearby how to handle the attack. "Listen: I am injured in a Rami-Levy in Mishor Adumim; I am a medic from Jerusalem," the medic says to the hotline operator. "There was an attempt at a terror attack here - I was also injured - someone stabbed me from behind and on my side, I have a fracture in my hand." The operator then attempts to speak, but he cuts her off. 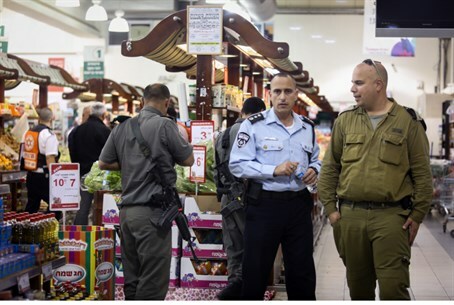 "Listen," he continues, "the [attacker] went crazy inside the Rami-Levy supermarket in Mishor Adumim." Loud voices can suddenly be heard in the background. "He ran," the medic explained. "I don't know where he ran to and it could be that the scene is now empty [of terrorists - ed.]. I am trying to understand what is going on." The medic then wrestles verbally with the operator, trying to explain to her that he cannot access the exit to see whether or not the terrorist had been apprehended. The operator then tells him that the terrorist has been injured and apprehended and that the scene has been secured. The medic responds by telling her that he "is trying to get closer to see what is happening, and you [the hotline] aren't helping me here." "There is at least one other injury here," he continues, "apparently in the leg. I can't see if there are any more at the entrance." He then describes his own injuries. "I believe there were gunshots, I am trying to clarify what happened," he then states, emphatically. He calls over the other injured man, and they explain to the operator that they are attempting to hobble over to the entrance of the store and report their injuries - and what happened to them - together. The medic then tracks down a police officer at the scene and begins to explain what happened, trying to direct other officers and medics to the other injured man, who is suffering a concussion. He can also be heard instructing his own medics on how to treat him and attempting to bring calm to the victims and other witnesses, even as the noise level and chaos in the background escalates. At approximately 4:20 pm Wednesday, a terrorist - later revealed to be a 16-year-old from the Arab village of Al-Azariya - entered the superstore and began stabbing shoppers, injuring the two men. The stabber was later apprehended by an off-duty security guard at the scene. Two other suspects were arrested in connection to the attack, Walla! News reported some four hours after the fact, and at least one is a suspected accomplice who worked at the Rami-Levy branch.